Glaciers of the Olympic Mountains. Map by Steph Abegg. Glaciers on Mt. Olympus. Map by Steph Abegg. 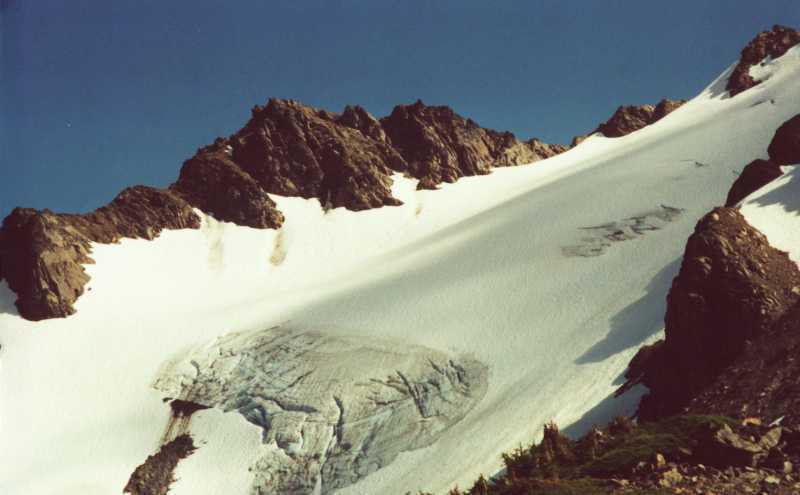 Glacial ice is one of the foremost scenic and scientific features of Olympic National Park. There are several glaciers crowning the Olympics peaks. Even though most of the glaciers in the Olympics are quite small in contrast to the great rivers of ice found today in some other areas of the world, the glaciers in the Olympics can be quite rugged and impressive. The most prominent glaciers are those on Mount Olympus, covering approximately ten square miles in total. Beyond the Olympic complex are the glaciers of Mount Carrie, the Bailey Range, Mount Christie, and Mount Anderson, as well as other smaller glaciers throughout the range. The movement of glacial ice, past and present, has produced striking geological features in the Olympic mountains. The lake basins, U-shaped valleys, and jagged peaks are the products of extensive glacial erosion that occurred many thousands of years ago when the year-round climate was colder and wetter. Glacial erosional processes continue today, but on a much smaller scale. As glaciers advance and retreat, rock is plucked, transported, and deposited by moving ice. Rounded, subdued mountains are carved into sharp-pointed peaks (horns), broad ridges are excavated into narrow, even knife-edged forms (aretes), and in many cases, a glacially-created bowl (cirque) at the head of a glacial valley will be sufficiently deepened or dammed by an end moraine to create a lake basin (tarn). The deposition of rock results in ground moraines consisting of rock blanketing the surface irregularly. Much rock accumulates on a glacier's sides forming lateral moraines and end moraines form when a glacier's terminus is stationary for a time. The furthest down-valley bend moraine is a terminal moraine. The finely-ground rock "flour" created by glacial abrasion often makes glacial meltwater look milky. Milky or "whitish" streams are a clue that there is an actively-moving glacier or glaciers upstream. The glaciers on Mount Olympus, especially the Blue Glacier, have been studied intensely since 1957 by scientific groups seeking valuable data on the composition of an Olympic glacier and how the ice responds to the climate from one year to the next. With the temperature and precipitation trends of the recent years, many of the glaciers of the Olympics are shrinking as the summer melt exceeds the winter accumulation. Click here to see some glacier comparison photos showing some dramatic recession of several of the Olympics glaciers. 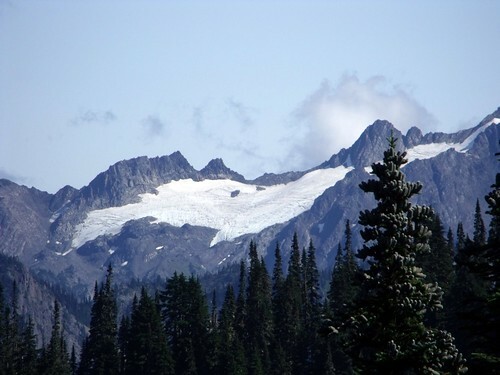 Below is a list of the major glaciers of the Olympic Mountains, along with photos. (Desperation Glacier on right.) Photo by John Scurlock. Photo by John Scurlock Sept 2007.